How many of us, in teaching the history of medieval urbanism, or of Gothic architecture, have lamented the all-encompassing spread of suburbs and spaghetti highways that have obliterated the shape of the medieval city with its clearly defined walls and monastic bourgs? In the 1970s, Saint-Denis was a dreary smoke-blackened industrial suburb to the north of Paris, difficult to get to from downtown, and even dangerous for the unwary visitor. The glorious history of the site was represented only by the presence of the great abbey church (now a cathedral). This began to change in 1973 when an extension of the Métro led to exploratory excavations north of the abbey church. What emerged was a fairly detailed image of the medieval settlement, comprising about one eighth of the town. With the foundation of the Unité d'Archéologie in 1982 this investigation was extended: about thirteen per cent of the urban soil of medieval Saint-Denis has now been sampled. This archeological operation has not been conducted in a purely academic spirit, but is intended to inform urban development, provide vital educational resources (an MA program in Conservation-Restoration of Cultural Objects, for example) and, above all, to provide residents (twenty-eight per cent have a nationality other than French) with a better sense of their urban environment. Outreach programs include walking tours, the establishment of an archaeological museum and a society, Franciade, that produces and distributes publications derived from Saint-Denis's archaeological heritage. Some of the outreach programs have the interactive quality of a good internet website—for example, the 'Changeable Model' of Saint-Denis allows the user to play with layers of urban development, superimposing one atop the other and experiencing the problems of chronology and thematic development. 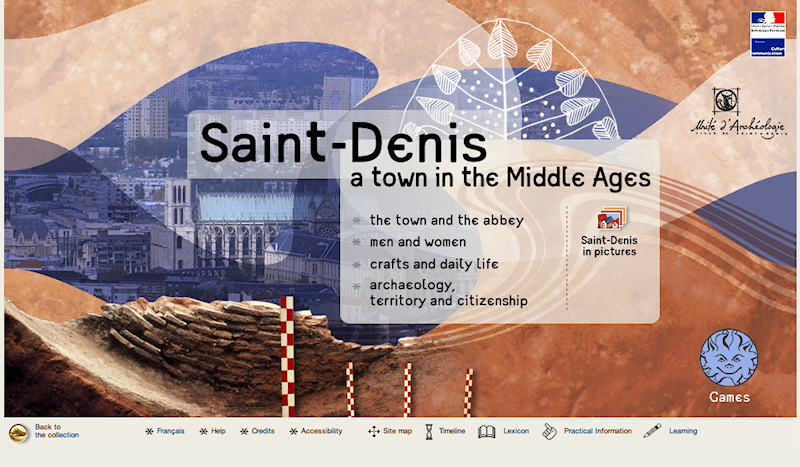 Saint-Denis: A Town in the Middle Ages, an interactive, multi-layered website sponsored by the French government (Ministry of Culture) and the town of Saint-Denis itself, through its archaeological division, the Unité d'Archéologie, resulted directly from this program of archaeological investigation, urban development and education. It is, in some ways, the digital equivalent to the Atlas Historique de Saint-Denis , published in 1996. There are, in short, two stories to be told here: the first one is of almost forty years of patient archaeological investigation driven partly by the desire to uncover and to share (most recently through the Internet) urban identity. The second story is of the continuously changing shape of the settlement we call 'Saint-Denis'. The Home Page of the website (Fig. 1) is a montage of a photograph of the town and abbey of Saint-Denis as they are now with an 'archaeological' graphic overlay that provides a foil and suggests the layering of time. The user is offered a menu with four chapters: the town and the abbey, men and women, crafts and daily life, and archeology, territory and citizenship—it is from this last chapter that the user can establish the story told in the opening paragraphs above. And with each chapter comes multiple subdivisions, and sub-subdivisions. Allow me now to sketch my experience as I began to move between the chapters and establish the extent and limits of the material and the linkages. My interests are principally those of a historian of urbanism and also of Gothic architecture, but I have always been fascinated by how a city site is first established and the role of myths and story-telling in that foundation. Under the heading 'Before Saint-Denis' in the first chapter, the user is provided with a relief map (unfortunately without indication of familiar landmarks) and a geological map. The English translations are quite good (though some French passages, oddly, remain untranslated), technical terms are highlighted and a click will provide an explanation; internal linkages are underlined, and the user finds himself whisked into other parts of the site, including 'Men and Women' and 'Crafts and Daily Life'. Fortunately, return to the previous frame is always easy. A click on the archaeological marker at the bottom of the page will take you back to the top, where the main menu is visible, allowing the user to navigate easily through the site. Passing to the next stage, 'The Site from its Origins', the user is catapulted from the Neolithic first settlers of the site to a three-dimensional reconstruction, based upon archaeological evidence, of the first Christian structures on the site—there is only a very brief reference to the vicus Catulacensis, and no reference at all to the presence of the extraordinary pre-Roman Gallic inhabitants of the area, the Parisii; no reference to Roman Paris (Lutecia) or to what made this particular spot attractive for human settlement and the eventual extablishment of a holy site (the tomb of Saint Denis). This omission is all the more surprising since this website is one of a series of grands sites archéologiques that includes Paris, Ville Antique. 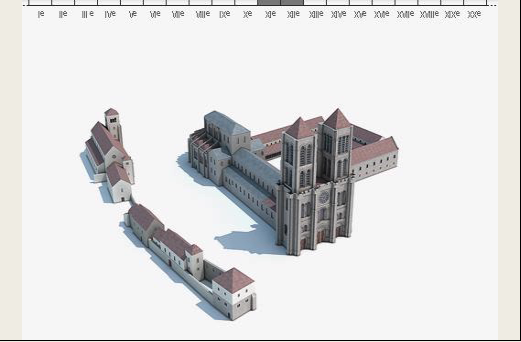 The most valuable feature, for art historians, is the sequence of three-dimensional images of the key buildings on the abbey site (Fig. 2). To the right of the reconstruction are a series of enigmatic icons—the user will need to establish the function of each by allowing the cursor to pass over the icon. The fixed view of the buildings can be located on the plan of the present complex (though the plan, excessively light, is barely visible) and the complex can be rotated. Particularly useful is the last button, a question mark, which provides more technical information about the archaeological evidence behind the construction of the model. 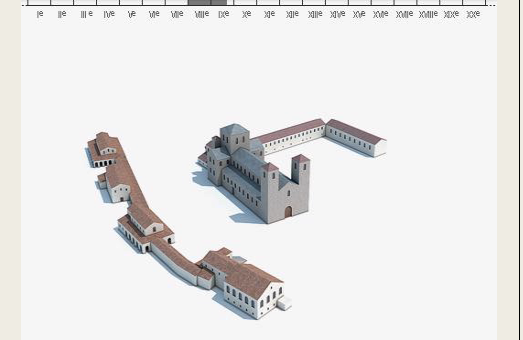 Moving through, chapter-by-chapter, the user can watch the transformation of the abbey complex, taking us from the initial site, with its 5th-century funerary church flanked to the north by a necropolis and range of buildings going back to Roman times, to the extension of the funerary church in Merovingian times (6th century), to the dramatic rebuilding of the church under Abbot Fulrad (769-775); to the addition of an eastern crypt under the supervision of Abbot Hilduin; to Abbot Suger's new western frontispiece and chevet (1130s-1144); to the completion of the main body of the Gothic church under Abbot Eudes Clément du Mez (after 1231). The image of the church after Abbot Suger's famous 'Gothic' rebuild is particularly interesting (Fig. 3). Here we see the old wooden-roofed 8th-century nave (extended to the west) with its new twin-towered frontispiece and, to the east, the new chevet, extending to the east of the monks' liturgical choir and providing a raised and brightly lit platform for the tomb of Saint Denis and his companions, Apostles of Gaul. The makers of the model have suggested that the new chevet butted up against the old crossing tower, and that it had some kind of radial buttressing. It is interesting to reflect on the old and the new means of representation. Sumner McKnight Crosby in the 1940s reconstructed the different stages of being in the abbey churches of Saint-Denis in solid wooden models set upon a plexiglass base upon which was etched the plan of the present church (Fig. 4). The virtual 3-D model, on the other hand, allows you to flip back and forth, and to rotate. As these images come up, the user finds in the right margin further options allowing the exploration of additional dimensions (for example, the tomb of Queen Arnegunde in the Merovingian church), or to set in motion a sequence of 3-D reconstructions of 'Saint-Denis from the beginnings to the present day'. This sequence has a sliding time cursor to indicate chronology, though it would have been helpful to provide a label for each and to allow the user to control the sequence by sliding the cursor. Some of the critical research behind these reconstructions goes back to the work of the American archaeologist, Sumner McKnight Crosby, but whereas Crosby focused exclusively on the church, this project puts the church in its urban context, taking us from the formation of a royal abbey under King Dagobert to the construction of urban fortifications (the castellum) to the medieval town where trading, crafts and industry flourished, reaching a crescendo in the 14th century. It is the first chapter, 'The Town and the Abbey', that provides the main thread of the plot. The user can follow the story of the town from its origins, to the establishent of a walled urban space, to the economic flowering of the site, to 19th-century industrialisation. The other two chapters, 'Men and Women', and 'Crafts and Daily Life', allow the designers of the site to harness the artefacts found in the excavations to tell the story of individual peoples and their daily pursuits. The user will be led to these chapters by linkages provided in the 'Town and Abbey' texts — or they may browse through in a synchronic way. The presence, side-by-side, of Hunus the monk, an otherwise unknown figure whose sarcophagus was found in the vestibule of the funerary church of Saint-Barthélemy with Saint Denis himself, not to mention the Abbot Suger, may seem a little odd within the old elitist environment of Art History. But many of us believe that this environment needs to be changed. And then there is the pilgrim, as well as a baker and a traveller. A big disappointment (from a scholarly rather than a technical level) is the uncritical story of the role of Pierre, Eudes and Raoul de Montreuil in the reconstruction of the abbey church. Some reference to the scholarly debates on the subject would have been welcome. And where is that legendary figure, so central to the life of St-Denis, the Pseudo Dionysius, author of influential texts on the theology of light? In 'Crafts and Daily Life' the program invokes the artefacts discovered in the excavations to provide a picture of the different industrial activities that occupied the life and generated the wealth of the inhabitants. In some cases, the interactive potential of the web could be harnessed to give the user a better understanding of technique. In 'A Merovingian Belt Buckle Workshop', for example, the user is given a page of diagrams with an accompanying text that exactly mimics the old book-based explanations. Lost-wax casting is difficult to understand and a demonstration using three-dimensional animations or sequential images would have been welcome. I would have liked to have access to more objects—we only catch a glimpse of the enormous number of artefacts in the last chapter, under the 'reference collections'. Has the Saint-Denis website fully realised the potential for electronic publication? This is hard to answer when that potential is being continuously extended. Multiple linkages do allow us to move between diachronic story telling and synchronic analysis, and navigation is, for the most part, nimble. Design is legible, if a little heavy handed, and layout is fine, and although some of the icons are arcane, written instructions can be summoned by the lingering cursor. Downloading is slow and animations are jerky. The images are very small, legends hard to read and zoomify technology missing. The 'Saint-Denis in images' section is particularly hesitant and it is hard to see how this feature relates to the main chapters. The games are of mixed value—educationally, the most useful one is 'The Imaginary Travels of Mr van Buchel', which combines the traveller's account of his passage into and through urban space with the 1575 Pourtraict de la ville Sanct Denis en France to provide a memorable image of the urban fabric of medieval Saint-Denis. Whereas the program ran fairly well on my MacBook using a Safari browser, it ran into some difficulties with Firefox. Greater than the technological challenge is the humanistic one. A great Gothic church like Saint-Denis, fully equipped with its tombs and its liturgical/devotional practices has the power to convince you of the 'inevitable'. How was it that this particular site became central in the construction of the 'manifest destiny' of the national identity of France? The website does nothing to answer this question and dispel the myth of manifest destiny. The story of the cephalophores who picked up their heads and walked out from Paris to choose the site of their entombment is presented without question or debate. The computer would be the ideal medium to carry the multiple possible explanations of the phenomenon of the cephalophores. The user does not get the sense of surprise from the fact that whereas most saints are gathered into the city, in the case of Paris, the opposite happened. However, my final thoughts about Saint-Denis: A Town in the Middle Ages remain overwhelmingly positive. Just as the 12th-century church of Saint-Denis catered to pilgrims as well as literati, this website will, I think, engage the interest of the layperson and provide a useful source of information for the specialist.